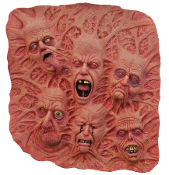 Large all latex deluxe dimensional wall piece of realistic tortured anguished faces, appearing to push out of a deadly organic stew. Extremely detailed horrific display with lifelike faux stretched tendony fibers throughout. Mount on your dungeon door or torture room entrance, or use several side by side for the creepiest possible shock factor! Approx 2-feet diameter. Heavyweight dimensional molded front with hollow back. Big Size: Approx 24-inch (60cm) diameter x 3-inch (7.5cm) deep. Care: Spot Clean with rubber latex-friendly cleaner.